Lamy 2000 is one of the most iconic pen of the modern era. The Lamy 2000 designed very much with the Bauhaus movement in mind. It's modern and clean design makes it very recognizable. Many have recommended this fountain pen wholeheartedly, while many have shyed away from it thanks to its reputation of having a temperamental nib. With all the positive and negative of the pen in mind, I took the plunge and got one from Pen Chalet to find out for myself. 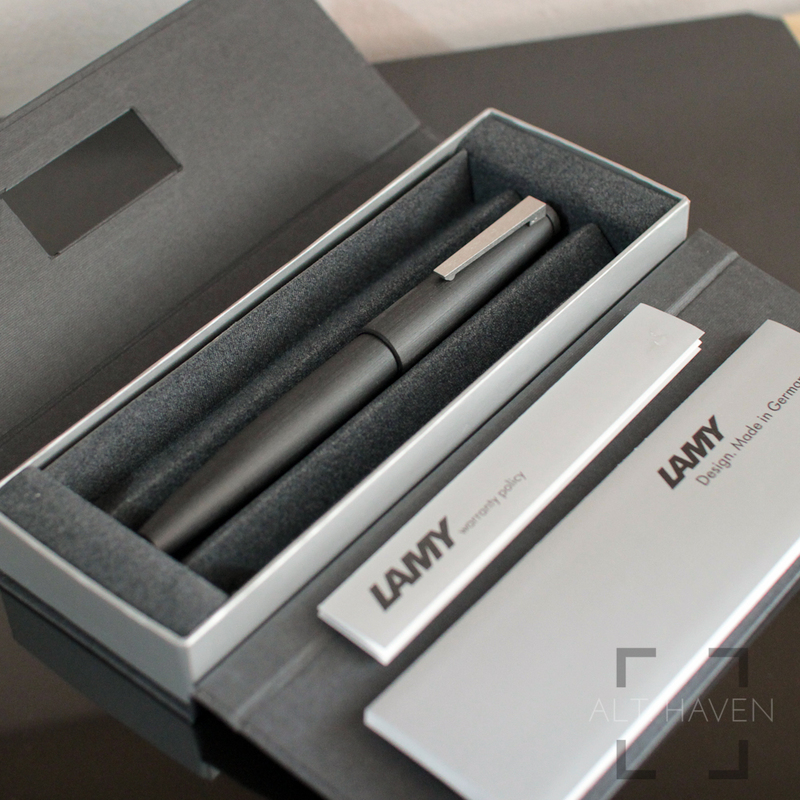 The Lamy 2000 came in a cardboard box that unfolds to reveal the pen within. It is the same packaging as the Lamy Studio. I had expected the Lamy 2000 to come with better packaging since it is a more pricey pen compared to the Lamy Studio. However this is just me nitpicking since what's important is the fountain pen. The Lamy 2000 is made of makrolon. It is a type of fiberglass material. It feels smooth yet textured when I run my finger over the barrel. It feels almost like touching wood. The pen isn't really black but more like a dark grey with very faint lines running down the entire length of the pen. The Lamy 2000 has an aerodynamic shape especially once you remove the cap. The design is very minimalistic and zen-like giving an understated and classy look. The matte finish also helps prevent fingerprints from marring the beautiful pen body. The Lamy logo is etched on one side of the clip. This is unlike most pens where the brand is emblazoned across the body or the centre band. The Lamy 2000 is a piston filler style fountain pen. The knob of the piston flows seamlessly into the pen barrel. I could barely tell where the seam seperating knob from barrell is. The Lamy 2000 has higher ink capacity thanks to its piston filling system. 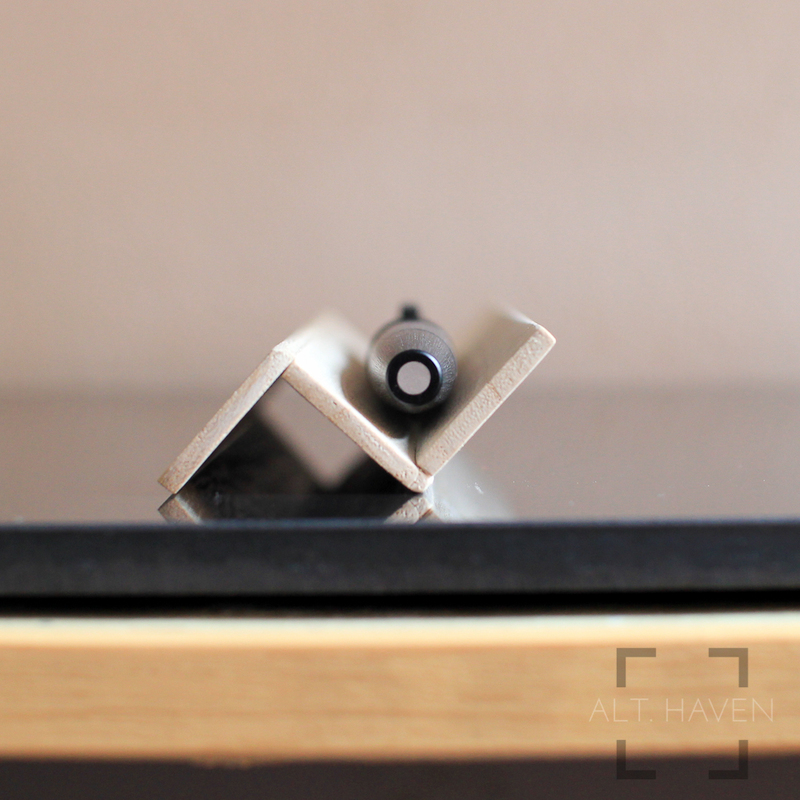 The ink window is below the grip section, allowing for a quick look to guage the ink level. The cap sports a spring hinged metal clip. Just press slightly on the hinge and the clip opens easily. That makes it easy to clip the pen over a shirt pocket or a pen loop. The snap on cap closes with a satisfyingly audible click that I particularly enjoy. It reassures me that I definitely closed the pen. The cap posts easily on the barrell and it sits securely without rattling against the barrell. (Lamy Studio I am looking at you) No matter using it posted or unposted the pen doesn't feel back heavy. 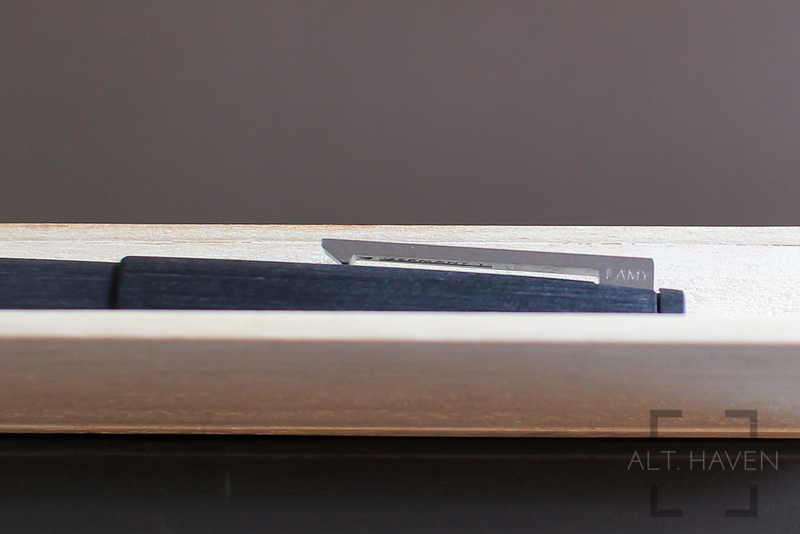 The grip section is made of brushed metal that flows seamlessly into the makrolon barrell. Though the grip is made of metal, the brushed metal texture helps with my grip on the pen. I don't write for long periods of time so I can't attest to its slippery-ness. The best thing of the Lamy 2000 is partially hidden in a hood. The hooded nib is actually a springy gold nib. The nib is a joy to write with. Though I have read many reviews commenting on the narrow sweet spot the nib has, I face no such problem. Maybe my natural writing angle and position allows me to hit the sweet spot perfectly. Maybe I am lucky and I got an excellent nib. Regardless which it is, what matters is the nib is sweet! It has some line variation thanks to the gold nib. The flow is just right. It keeps up with my writing but not so wet where I am smearing ink as I write. The Lamy 2000 can be disassembled for easy cleaning. Check out Stephen Brown's video to see how to disassemble the Lamy 2000. It is just too bad that the nib unit isn't for sale seperately. The recommended retail price for Lamy 2000 is $199. However the pen is sold at $159.20 at Pen Chalet and various other retailers. Though this fountain pen is a little pricey, I think this iconic pen is worth a spot in anyone's collection. Disclaimer: I got the Lamy 2000 on a discount from Pen Chalet. This has in no way influence my opinion on the pen reviewed.